Well, I have to update you a little, sorry it's been awhile. So much has happened! 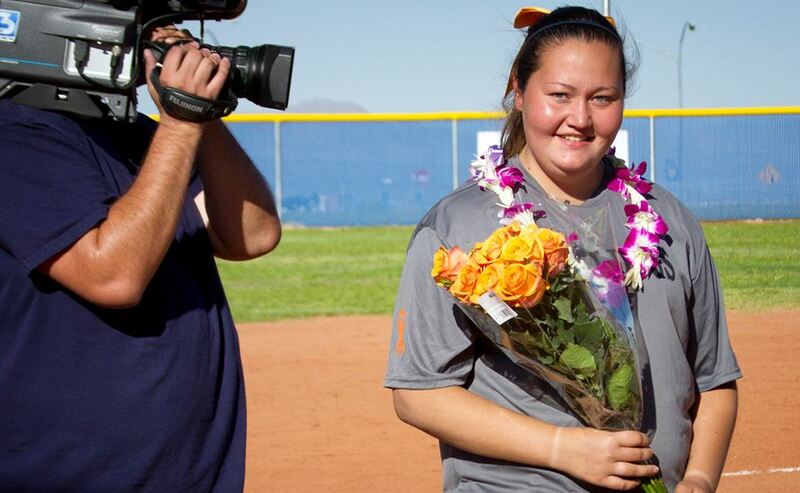 Kassidy's softball senior game was an amazing day. The younger girls always decorate and prepare the field before the seniors show up. When all the girls arrived, except for Kassidy were wearing their Centennial jackets (she thought it was odd since she had not been told about the change in uniform)... As the seniors made their way to the field they all lined up with the younger players and proceeded to unzip their jackets. 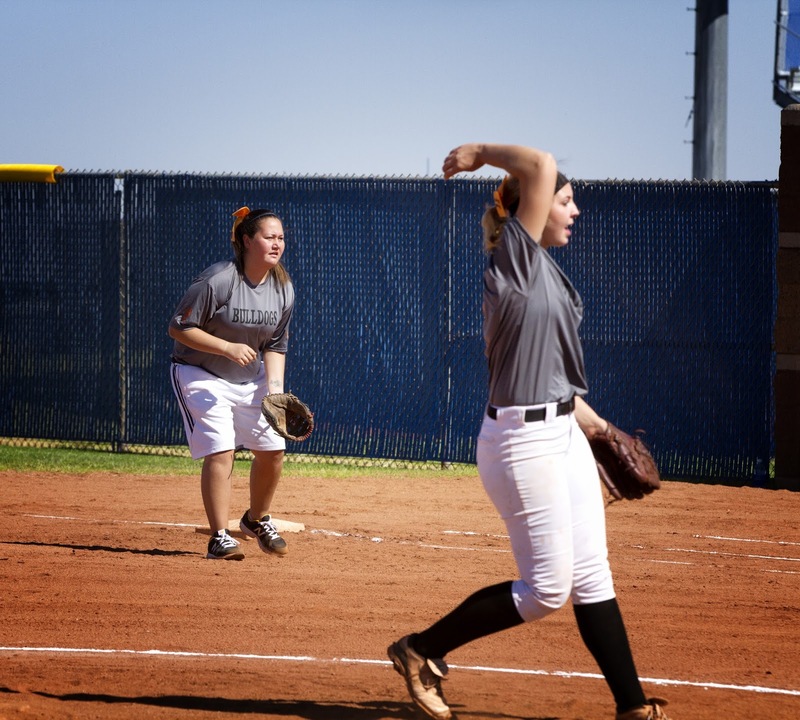 They surprised Kassidy that day by wearing grey shirts for Brain Tumor Awareness Month, the "Never Give Up" motto the back of the shirts, #11 (Kassidy's softball #) on their left sleeve and and orange bow with the grey ribbon and #11 on it. Kass got emotional! I must say that I could not be more thankful to her wonderful softball team for the support and most of all to her coaches. 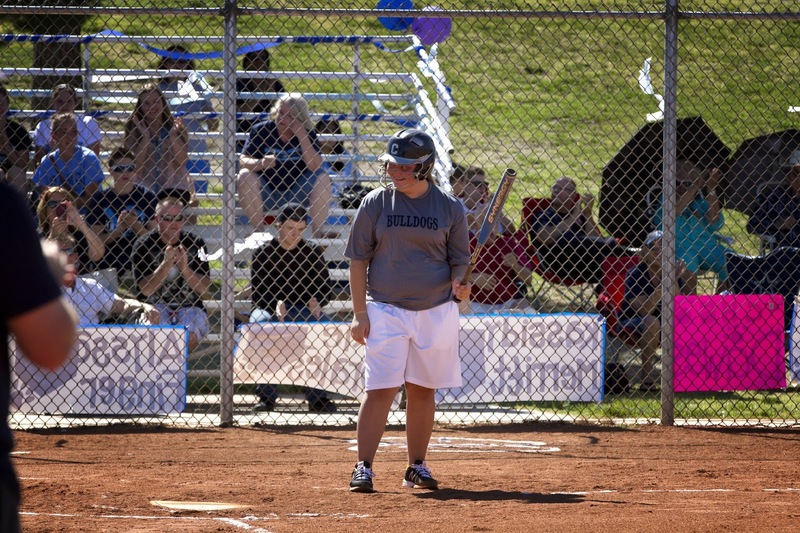 Ever since diagnosis, Kass has felt part of the team even if she could not actually play the game, but her coaches knew how important softball has meant to her and they have made a commendable effort to include Kass and made her feel as in integral part of the team. Ryan and I could not be more appreciative to them. It was so great to see the stands packed, I had never seen them so full of family & friends that had come to see their own senior players and those who had come to see Kass step on the dirt one last time. Family came from Wyoming, friends of Kassidy made the trek from all over the valley, coach Spencer made it from Texas, UNLV womens baskeball players came out and of course Kyle came home to surprise Kass. 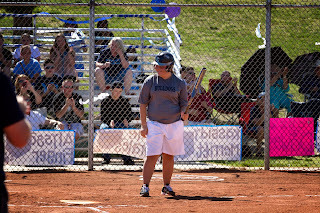 Kass was put in the first inning, as she was announced by coach Spencer the crowd went wild and she actually got a hit which grounded towards second base. She also played first base for just a bit. What a proud moment for our family to see her so happy and have flash backs of the amazing player she once was. 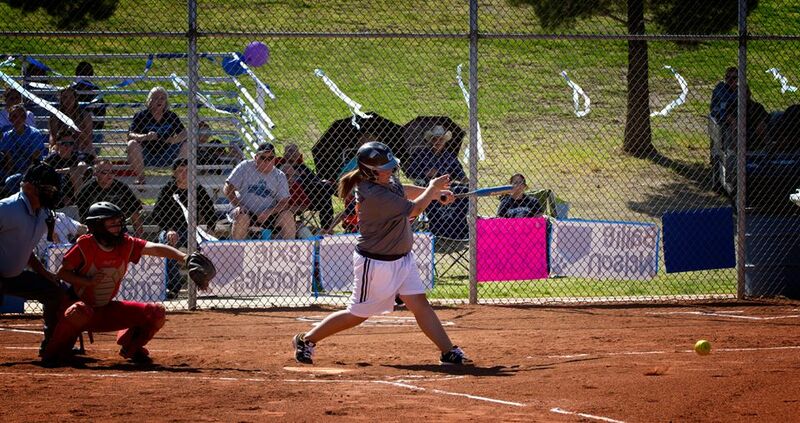 First at bat in 2 years in a REAL game! Can her smile be any bigger! 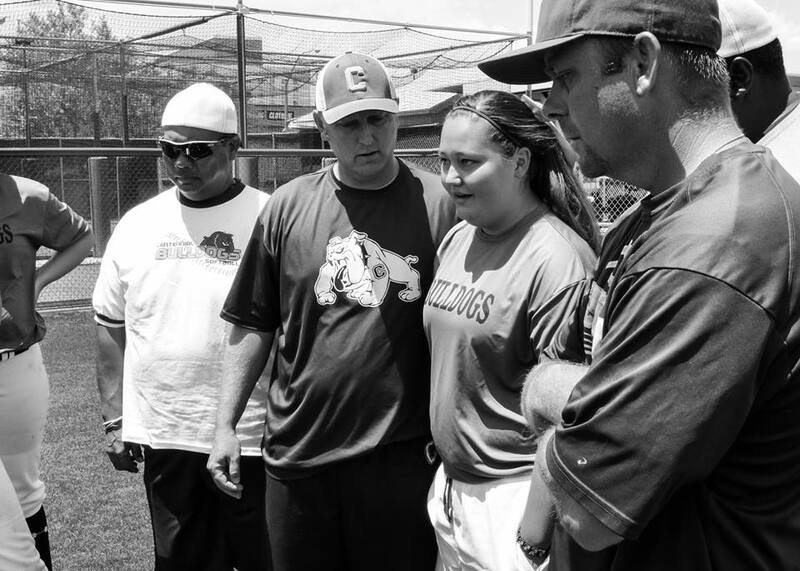 Channel 3 News came out to cover the story, but arrived right after she had batted, so they asked coach if they would put her in one more time so they could get it on camera. So they did, this time she strucked out, but it didn't matter she again had a cheek to cheek smile that would not wear off for hours. After the game, they presented each senior, escorted by their parents to the field and then coaches presented them with a hawaiian lei, tons of hugs, gifts and more flowers. So emotional to see all these girls that Kass has grown up with to go on and play at their home field one last time, many to go on and move on to play in D1 & D2 colleges. So proud of them all! 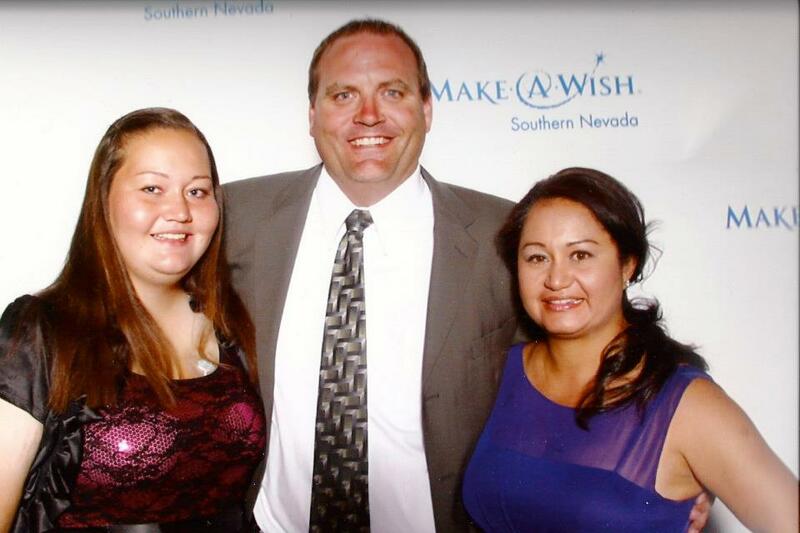 Kass got invited to speak at the Make-A-Wish Ball at the Paris Hotel to talk about her wish to Australia. This event is a silent auction to raise funds for the organization and Kass happened to be one of the guests of honor. It was fun to dress up and have a nice night out with a fabulous dinner. She got to meet a girl about her age who has cystic fibrosis, they spent the night chatting. I always like when she meets other kids about her age struggling too so she doesn't feel alone. 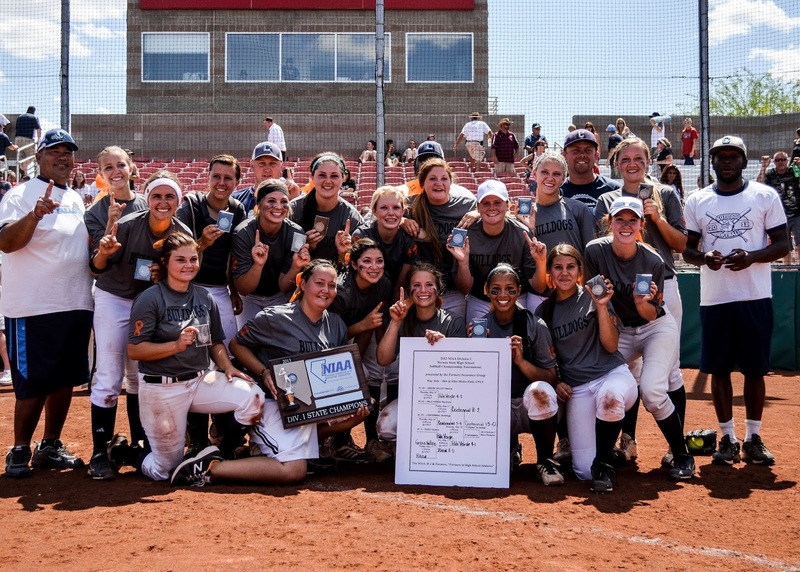 Mid May Centennial Softball made it to the state softball playoffs. They dominated their opponents during them outscoring them 77-11. Wow! They definitely earned their spot into the Championship game beating each team one by one. 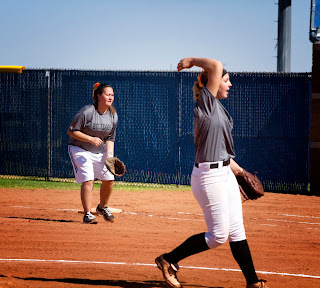 That day we arrived early at the UNLV softball fields and were excited to see all the girls wear their grey shirts again. 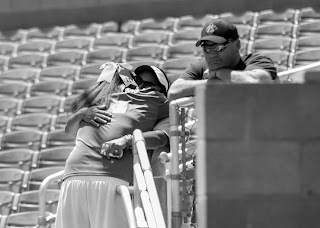 Ryan and I picked our spot in the stands, as we sat by ourselves, we remembered how 2 years ago Kass was having brain surgery while Centennial softball girls played for the State Championship, while already getting emotional, Kass came up to us clearly upset. We were worried she was not feeling well, but she was upset because it was gonna be the last time she would ever wear a Centennial uniform and coach had asked her to say a couple words of wisdom in pre-game huddle. She wanted a hug and guidance on what to say. According to some of her teammates she did a great job, but could not stop the tears from falling. She said: "We are not done yet!" 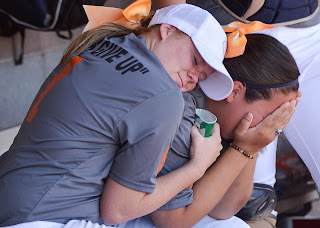 "This may be the last time I step foot on a softball field and the last time I can call myself a ball player, I love you guys........" I guess there was not a dry eye in the huddle. 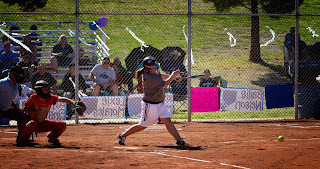 The girls proceeded to play a stellar game, winning 13 to 0 against Palo Verde. 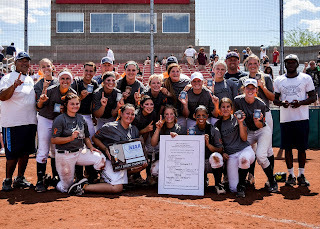 Making Centennial Varsity Softball first team in the state to ever win a back to back championship in women's softball. What a day! 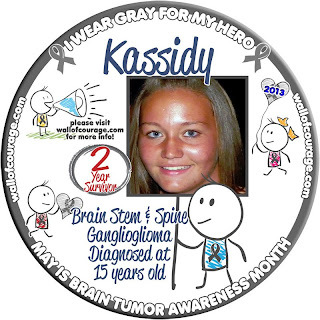 Couldn't asked for a better way to celebrate Kassidy's 2 year survivor anniversary. My friend Don caught this moment, I didn't know anyone was watching. Love this picture of her teammate Kate consoling Kass. Congratulations Kass, 2 year survivor! 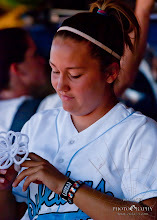 On May 21st we had Senior Awards Night at Centennial HS. Kass was invited to be recognized for her awards, honors and scholarships. 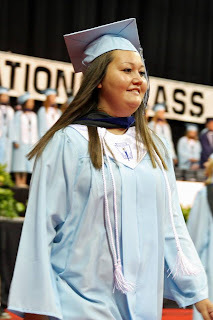 We are so very proud of her, she finished her high school career with a 4.2 gpa and received her advanced honors diploma, high honors graduate, and 4 academic scholarships; no small feat with all the days she had to miss because she didn't feel well or had doctor's appointments. Not only that, but she got the last award of the night, "the principal's award" given to her for her bravery, hard work, never give up attitude and perseverance. She accepted her award and when she turned around the whole audience was giving her a standing ovation. I broke down sobbing! She worked so hard to maintain her grades up and I know it wasn't easy. There were times she was so tired she said she would have to read things 2 or 3 times to understand and also times when she was so nauseous she just wanted to come home and sleep. So Ryan and I are beyond proud of her for trying so hard. She also attended the Public Education Foundation recognition luncheon at the Venetian Hotel where she was presented two of her scholarships. Great to see all the kids around the district that received these great scholarships, some friends and kids Kass grew up with. After the ceremony each kid is to give their parents a rose for supporting them. We also found some time to do Kassidy's senior pictures, I know.... kinda cut it close, we've been so busy. On picture day I prayed she would feel good enough for pictures, since she's been battling with nausea so bad. We decided on Nelson's Landing which is about 1 hour away towards Arizona, we love the backgrounds and it's rich colors. We met Dana, the photographer out there around 5:30pm since she loves the natural light around that time. At first Kass was not happy about this whole picture thing, she had not tried one of the outfits I bought for her till that moment and again I prayed they fit and looked good on her. I was asking God for a big favor there! Dana was so good with her and Kass immediately felt very comfortable with her. The pictures turned out beautiful and I think she's glad I made her do it. She looked beautiful! Softball banquet night was another great night to honor these great girls. 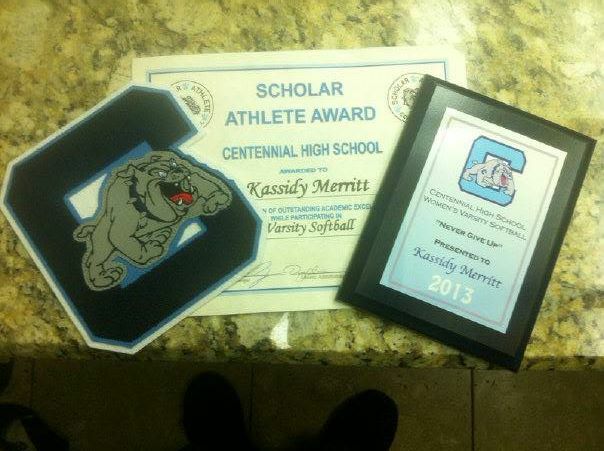 Kass got her navy letter for lettering in a sport 4 years in a row and the "Never Give Up" Award from the coaches. Coaches got emotional and so did the parents including myself. I believe these group of girls were very special to the Livreris, they are loosing 7 seniors this year, most of them been on varsity since their freshman year including Kass. 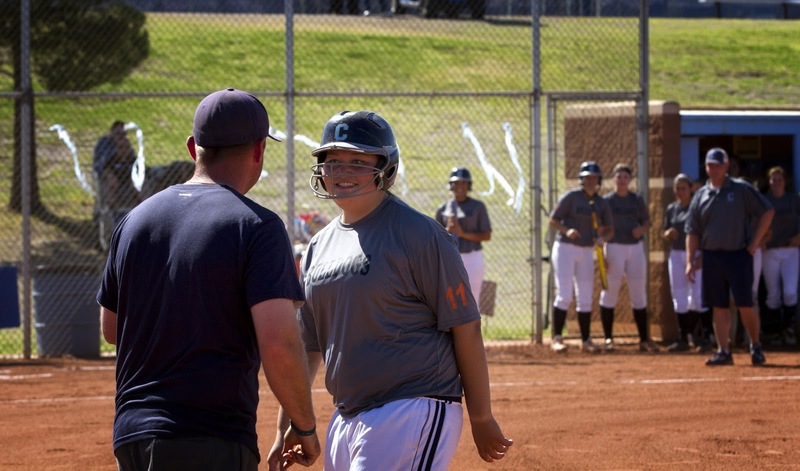 But since Kass will be going to UNLV this fall, they invited her to come back and help coach the catchers next year, she was excited and gladly accepted. The first weekend in June, Kass decided last minute to attend Nevada Childhood Cancer's Teen Retreat at Torino Ranch, this always causes me stress because that means someone else will be doing her medicine, cleaning her port, preparing medicine bags etc. But I was sure glad she got the opportunity to go. She got to see others are going thru something similar and even sometimes worse than her. We were asked to write letters to her about what she means to us, she came saying she had a fabulous time, but was very emotional for her when she read our letters, especially her brother's letter. So sad it's her last year going to camps since she will be 18 this year. Graduation day came fast! Family came in from Utah, Wyoming and Panama. We also got a call from Ron Kantowski who works for the Review Journal and first wrote about Kassidy's story in 2011 when Kass was first diagnosed, he wanted to follow up with an article on Kass and didn't want to miss her graduation as he had promised he would 2 years ago. She was all smiles during the ceremony, her name was called and we went wild, we could also hear cheers from other sections of the Thomas and Mack. She opted to not take her dose during graduation so she wouldn't have to carry her backpack, she had her zofran ready and we carried her throw up bags just in case, but she felt great! I still can't believe high school is over, she was just going to kindergarten. It was so great to spend time with all the family this past weekend, we made a family reunion out of it. 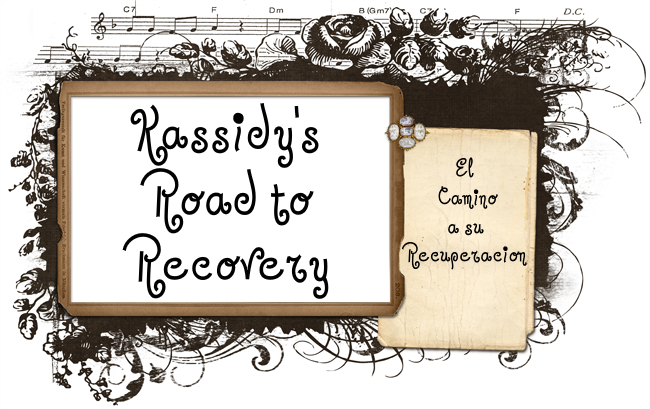 Now after probably the most emotional month and half this week we've been busy getting things ready for Kassidy's graduation party and some doctor's appointment. Kass will need to have another sleep study with the cpap machine to see exactly how much oxygen she will need and what type of mask. Her first sleep study showed there are times where she dips down to 64% oxygen at night, this could be causing her non stop nausea and sometimes headaches. This month she will also have a swallow study since she has been having a bit more problems with choking on liquids when she drinks and an endoscopy to check her esophagus, stomach and see about her hiatal hernia. Last time, we went to see her local oncologist he also referred us to a neurologist so we go see him at the end of the month. Will also be following up with her endocronologist who is working on helping her with her adrenals that were suppressed because of so much steroid use. She seems to be doing much better with her thyroid issues that also the steroids damaged and is now loosing weight little by little. She's so excited about this. Clothes that have not fit her in her month are not fitting. What a great feeling for her! And today, we have the dreaded MRI, please remember to keep Kass in your prayers. We are hoping for a stable scan and if that happens that means we are on our way to weaning her to her final maintenance dose of 160ml on bag 1. Also we are hoping to have a mediation with the insurance today about their coverage of her treatment, keeping our fingers crossed big time on this one. We can't handle much more of these insurance issues. We should know of their decision in about 5 days.